Long before anyone would christen it "The Dust Bowl," Nola Merrill senses the destruction. She's been drying up bit by bit since the day her mother died, leaving her to be raised by a father who withholds his affection the way God keeps a grip on the Oklahoma rain. A hasty marriage to Russ, a young preacher, didn't bring the escape she desired. Now, twelve years later with two children to raise, new seeds of dissatisfaction take root.When Jim, a mysterious drifter and long-lost friend from her husband's past, takes refuge in their home, Nola slowly springs to life under his attentions until a single, reckless encounter brings her to commit the ultimate betrayal of her marriage. For months Nola withers in the wake of the sin she so desperately tries to bury. Guilt and shame consume her physically and spiritually, until an opportunity arises that will bring the family far from the drought and dust of Oklahoma. Or so she thinks. As the storms follow, she is consumed with the burden of her sin and confesses all, hoping to find Russ's love strong enough to stand the test. I have mixed feelings after reading this book. 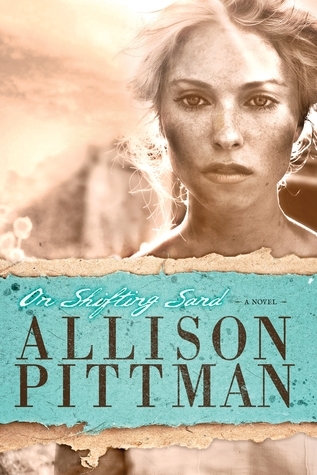 I have read most of Allison Pittman's books and all are different, so I was curious to see where this book would lead. This book was really depressing and difficult to read. I trudged through it because Allison always is able to create a story of God's grace but I honestly didn't feel good about the ending in this book. From the back of the cover the reader can tell this book is about a married woman with children who has an affair. It is something that continues throughout the entire novel which I wasn't expecting. It was really difficult to feel sympathy for Nola. I understand what Allison was trying to do with the story, it's just not what I enjoy reading. At the end of the book she talks about why she wrote this book, she wanted a story line of infidelity to end differently than most. I honestly didn't like any of the characters and the way the characters, Russ, the husband and pastor, portray Christianity was upsetting. I didn't agree with his beliefs or how he was acting even at the end. I did like the setting and the dust bowl history though!! This book is wishy washy for me. I guess my main point is not that I don't think Christians make mistakes like this it's just how the story wraps up that didn't settle well. I give it three stars and I wish I could do better! Others have loved this book so I suggest you read it and make your own opinion. I still love Allison's writing and will continue to read her books!
" I received this book from Tyndale Publishing for free in exchange for and honest review." Award-winning author Allison Pittman has penned more than twelve novels, including her series set in the Roaring Twenties—All for a Song, All for a Story, and All for a Sister. Allison resides in San Antonio, Texas, with her husband, Mike, their three sons, and the canine star of the family—Stella. Visit her at allisonkpittman.com. Why did you decide to set the story during The Dust Bowl? When I knew I was going to write a story about adultery, I was determined not to have the adultery resulting from any shortfalls in the characters’ marriage. No neglect, no alienated affection—none of the usual internal problems that might lead a wife to make the choices Nola makes. I needed an external enemy. The Dust Bowl gave me that. The circumstances made it impossible for a woman to fulfill her traditional role of keeping a clean home. The poverty of the Depression made it difficult for her to feed and care for her family. All of that chips away at Nola’s sense of self-worth, and makes her vulnerable to anything—or anyone—for validation. However, it wasn’t until I was in the middle of writing the story that I realized the real power of these storms. The dust and the wind becomes the voice of Nola’s unconfessed sin. It tortures her and follows her. The more photographs and film footage I saw, the more desolation and hopelessness I saw. It was a time and place in desperate need of rain, just as any sinner is in desperate need of Jesus Christ, the Living Water. The setting of the Dust Bowl took on a dimension greater than I imagined at the outset, and grows over the course of the story—just as the storms themselves did.